In Italy they serve these tasty morsels with a glass of wine and a bowl of walnuts & hard cheese! Wash and dry the sage leaves. In a small mixing bowl combine the flour and sea salt. Whisk in beer and combine until the batter is smooth and has the consistency of heavy cream. Add enough vegetable oil to a heavy cast iron skillet to reach 1/3 of the way up the sides of the skillet. Heat oil over medium high heat until the oil reaches 350 degrees. Holding the sage leaves by the stem, dip the leaves into the batter and shake off the excess from the leaf. Drop into the hot oil a few at a time and fry until the leaves are crisp and just beginning to turn a golden color (this will only take a few seconds). With a slotted spoon remove leaves from the oil and place on a paper towel. With your fingers take the apple slices and dip into the beer batter. Shake off the excess batter and drop into the hot oil. Fry the apple slices until the peel begins to pucker (this will only take a seconds). The apple will only be lighted coated with batter and will retain its apple slice shape. Remove apple from the hot oil with a slotted spoon and place on a paper towel. 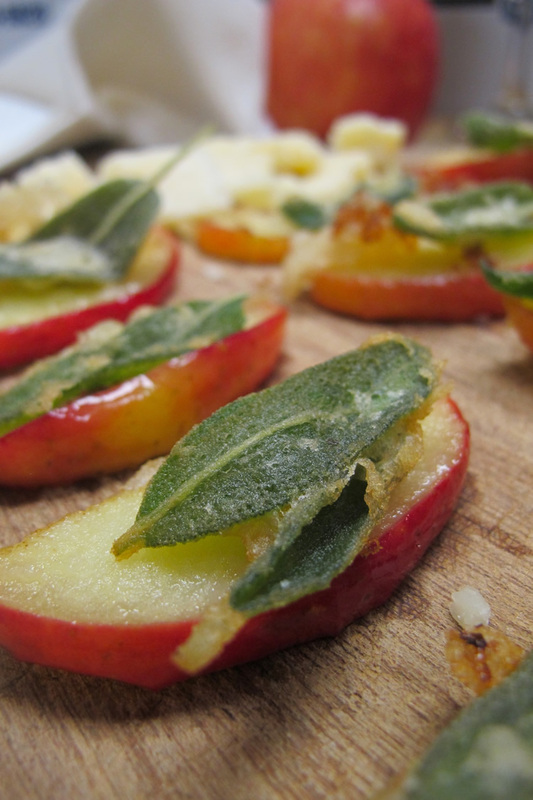 To serve, place fried apple slices on a serving plate and top each slice with a fried sage leaf.